Many small and medium-sized businesses delay purchasing new hardware and software in order to save money. But, while it may seem fiscally responsible, working with out-of-date hardware and software puts businesses at great risk that can outweigh any potential cost savings. Older systems don’t have the same security safeguards and capabilities as newer machines. This makes your computers and your network more susceptible to cyberattacks, malware, ransomware, and viruses. Even if you frequently update your computers with the latest patches and operating system updates, there will come a time when these updates are phased out, leaving those computers vulnerable. Plus, older hardware often lacks the capability to support the latest security software, including antivirus protection. Software updates arrive frequently for many popular applications such as Microsoft Office, Adobe Photoshop, or even the latest accounting software. Each new release demands more speed and takes up additional system resources. This can result in slower PC performance over time. Plus, as machines age, they don’t perform as efficiently, taking longer to boot up, open programs, and perform common tasks. This leads to frustration and lost productivity for your team. Older machines are also more prone to software glitches that can result from incompatibilities between legacy applications and the latest software. As your computers age, they require more and more maintenance to keep them up and running. Software glitches and sluggish performance also increase, resulting in more calls to technical support and increased support costs. Delays, sluggish performance, and software glitches all lead to reduced productivity. Combined with the added risks for malware and virus infections, the poor performance of older computers results in increased downtime and more headaches for your team. Speaking of downtime and headaches for your team… Things never go wrong at convenient times. And without IT lifecycle management, you run the risk of your systems failing at the worst possible time (like the middle of an important project). In order to avoid the security risks and problems associated with older hardware, small and medium-sized businesses need a strategy to replace aging PCs and servers on a regular basis. Enter IT lifecycle management, the process of proactively planning for the replacement of computers and equipment on a set schedule. Proactive planning puts business owners in control, allowing them to factor the costs of PC replacement into their budgets over time, instead of waiting until things break. This practice results in greater security, less downtime, increased productivity, and lower support costs, which ultimately saves money in the long run. Effective lifecycle management begins by understanding that every piece of equipment you use has a lifecycle that needs to be considered. In fact, by the time you purchase a new piece of equipment, you should have already planned for its replacement. It is also important to ensure that old equipment is disposed of safely, securely, and in an environmentally-friendly way. Your lifecycle management program should begin with a complete list of every computer you have in service. This includes desktops, laptops, tablets, servers, network equipment, etc. Relevant specifications such as RAM, CPU type etc. You may also want to make a note of each device’s primary function, so you can group similar equipment together. This could be helpful in planning out replacement equipment for each department in relation to your budget constraints. Now that you have an accurate inventory of your equipment, it’s time to begin planning for the replacement of your older machines. 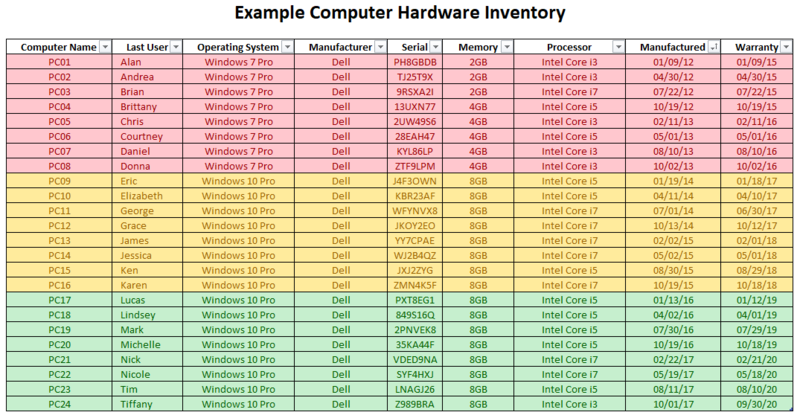 If this is the first time you’ve taken an inventory of your computers, you likely have many that are well past the recommended replacement schedule. You may not have the available budget to replace them all at one time. Begin by listing your projected budget for the coming year. Budget for the replacement of the oldest or most important computers in your network. As you begin to replace computers, add them to your inventory list so you can track their scheduled dates of replacement in the future. To complete your lifecycle plan, you’ll want to project the costs for replacement equipment over the next 3-5 years. This will allow you to see the entire lifecycle at a glance and make appropriate plans for proactive replacement each year. Making a plan to properly dispose of or recycle your old computers is essential. Computer components contain many materials that can be harmful to the environment. Most computer components can be recycled. If your business is located in the Jacksonville, FL area, seek out companies like Urban Mining that offer environmentally friendly electronic recycling services in the local area. If your business operates outside of the Jacksonville area, check online to find a reputable and environmentally friendly electronics recycling company. Before you turn your computers over to a recycling center or disposal site, be sure that the data on your hard drives is properly erased to avoid security concerns. And not just on your computers – devices like copiers and multi-function devices can also have hard drives that are gold mines for criminals looking for sensitive data. For just a few hundred dollars and with only a few hours of work, CBS News gained access to criminal investigation files, pay stubs (with names, address, and social security numbers), and hundreds of individual medical records. Ideally, an IT professional will securely destroy any hard drives from older IT equipment. But at the very least, you need to make sure that the data on all hard drives has been securely erased. It can be daunting to make a plan to proactively replace your computers on a set schedule, especially if you don’t have a dedicated IT staff. Fortunately you don’t have to handle everything on your own.